On the embankment before the main facade of the Academy of Arts there is a granite pier. This classically austere pier was erected after the design of the archi­tect Konstantin Ton between 1832 and 1834. On the upper terrace stand the bronze lamps. The lower terrace is decorated with two Egyptian sphinxes on high pedestals. The pier is embellished with granite benches bearing images of gryphons and stylized bronze girandoles each of which stands on four lion’s paws. Both gryphons and girandoles were cast in 1834. The majestic effigies of sphinxes set on the massive granite pedestals are mounted on the either sides of the stairway leading to water. 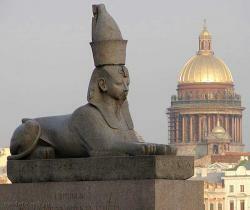 The sphinxes are a thousand years older than the Neva River which emerged only 2,000 or 3,000 years ago. They were found during excavations in ancient Thebes, the ancient capital of Egypt. The sphinxes are carved of pink granite obtained from the famous As­wan stone quarries. Each sphinx features the head of the Egyptian pharaoh Amenkhotep III and lion’s body. Amenkhotep III lived between 1455 and 1419 В. C. and ruled Egypt. These sphinxes embellished his palace. At that time Egypt reached the peak of power and wealth. One of the inscriptions says: “Son of Rah, Amenhotep, ruler of Thebes, the builder of monuments rising to the sky like four pillars holding up the vault of the heavens”. The sphinxes were brought from the praying tem­ple of pharaohs of Thebes where “Memnon Colossus” is standing now. These statues 18 metres high each, also represent Amenkhotep III. The son of that pharaoh was a noto­rious pharaoh-reformer Ekhnathon. His wife Nefertiti whose name means “the beauty came” is perhaps the most well-known woman of ancient Egypt. The sphinxes were bought by Russia from Egypt in 1831. They were brought from the banks of the Nile to St Petersburg in the spring of 1832. On their pedestals the words are inscribed: “Brought to St Petersburg in 1832 from the ancient Egyptian city of Thebes”. The mysterious mythological creature (the sphinx) has be­come a notable symbol of the northern capital of Rus­sia.